The most hotly anticipated review in MyGolfSpy history; you might think we’re talking about a new Callaway driver or a set of Mizuno irons. 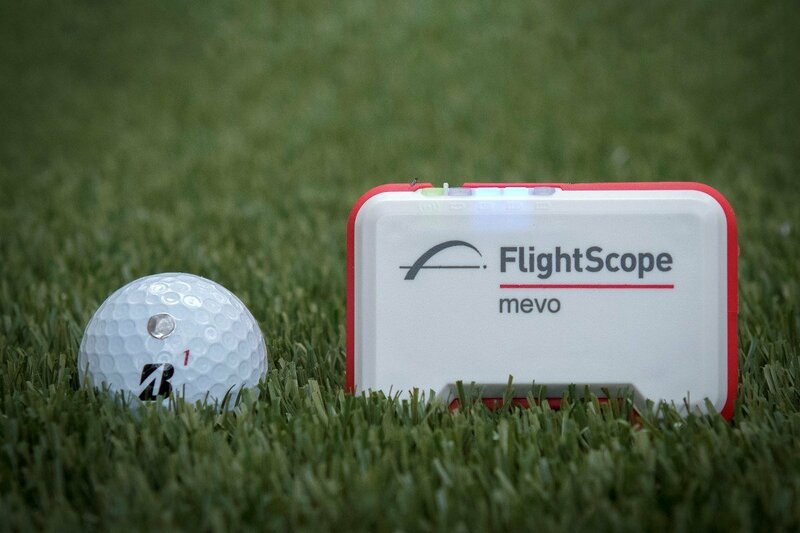 In reality, there’s a case to be made that the title belongs to this review of the FlightScope Mevo personal launch monitor. We’re going to cover a good amount here, so for those who just came here for the bottom line, feel free to skip ahead to the data or the conclusion. Interest in budget-friendly consumer launch monitor space is inarguably on the rise. Enterprise-class launch monitors with head tracking technology (Foresight, Trackman, FlightScope X3) still cost nearly as much as a Honda Civic. No thanks. Mid-tier offerings from Skytrak, Ernest Sports, and FlightScope (Xi) are beginning to drop in price, but you’re still looking at $2k minimum – affordable enough for some, but still quite a bit more than the average guy is going to spend. $500 though? For many that’s enticing. Skip the Epic, spend your money on the launch monitor and maybe improve your game the old-fashioned way. You know… practice (full disclosure, this is an entirely hypocritical suggestion as I constantly look to new gear to mitigate my own lack of practice). But how much can we expect for $500? For FlightScope, entering the consumer space creates both opportunity and risk. Mevo needs to be accurate or at least consistent enough and provide enough data to be useful. 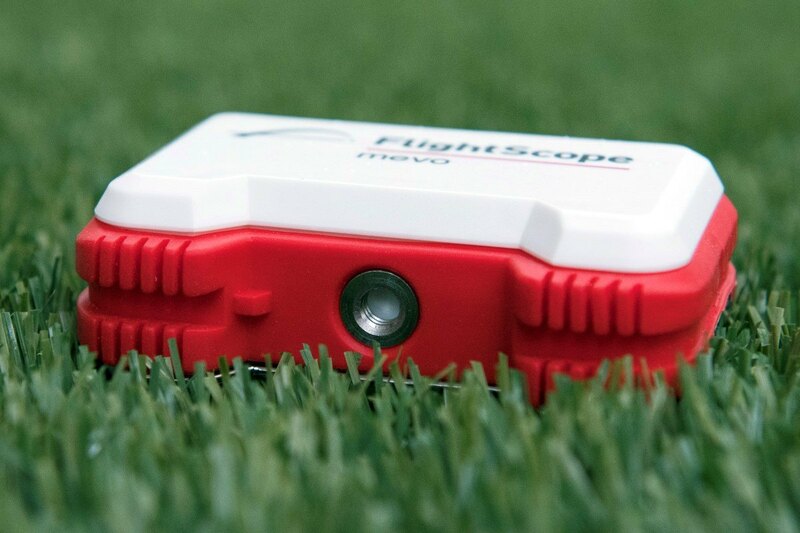 At the same time, it can’t be so good that it undercuts the market for FlightScope’s mid-range offerings. It’s a delicate balance, and that makes it a relatively bold move for FlightScope in its position as first of the big guys to take the leap. I’m reasonably certain that both Trackman and Foresight will be watching closely. Intentionally or otherwise, Mevo has become the test case from which the other guys will learn while charting their courses in the consumer space. Bottom line: While an enterprise-grade player in the consumer space is new and exciting, we must temper our expectations. For $500, is it reasonable to expect Mevo to offer the same precision and feature sets of units priced in the five to twenty-five-thousand dollar range? Where data is concerned, Mevo gives you club speed, ball speed, smash factor, launch angle, spin, carry yards, peak height, and flight time. That’s it. For some, that’s plenty. 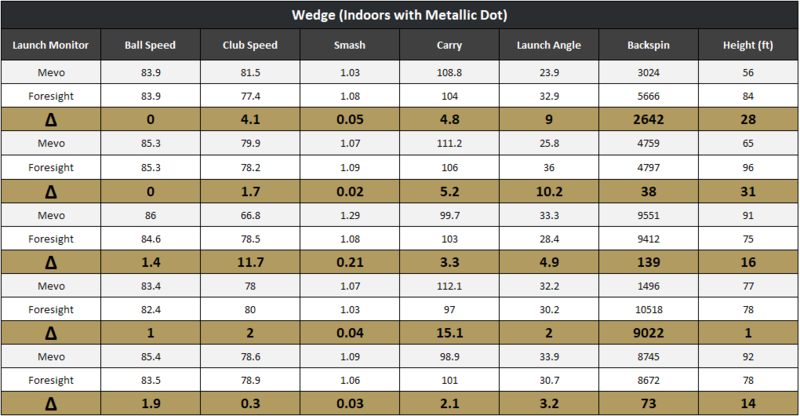 For others – particularly those interested in advanced head data (like path, face to path, angle of attack, etc.) it won’t be nearly enough. For those focused on precision, the lack of an offline measurement may be a deal-breaker, while fitters will likely notice that descent angle is not included as well, but again, this is a $500 consumer unit and it is, in no way, intended for use in any professional capacity. Again, we must manage our expectations to reasonable levels. 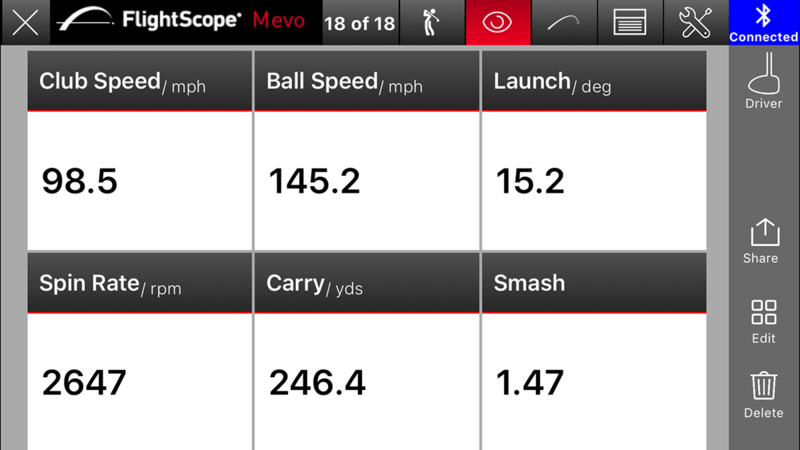 Mevo offers the ability to capture and analyze launch data, which is exactly what you’d expect from a launch monitor. That said, it notably lacks the game/skills modes of lower-priced units like Swing Caddie SC200. Frankly, I’m not too concerned about what is an admittedly limited competitive feature set. 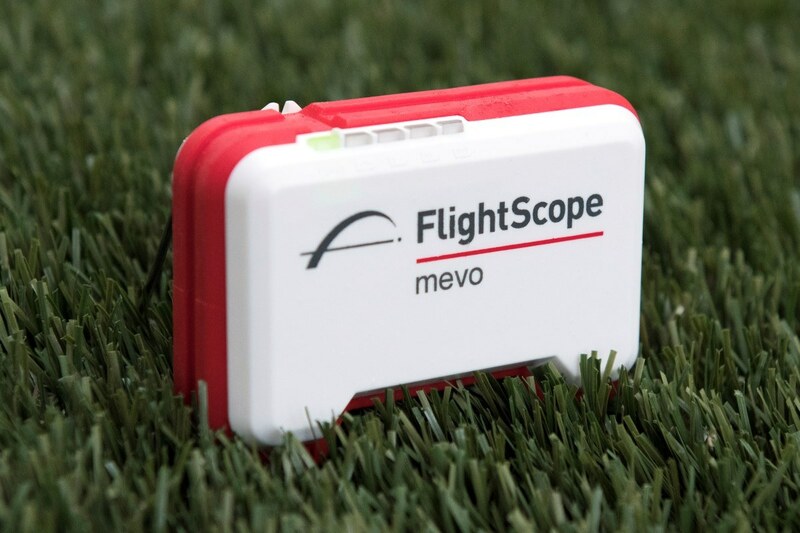 Mevo is in its infancy, and I expect that FlightScope will be rolling out enhancements to both the software (app) and the device itself (firmware) at a reasonably quick pace. First and foremost, the Mevo is incredibly small. Dimensions are 3.55 x 2.76 x 1.18 in. To put that in context, while it’s appreciably thicker than my iPhone 6 Plus, it’s also significantly shorter in both length and height. Oh, and it weighs less than half a pound. Portable is an understatement. Mevo will literally fit in your pocket. I don’t want to waste too many words on what it takes to get Mevo up and running. The app is well-designed, and that means intuitive. Connecting via Bluetooth connection is seamless. In fact, for me, it’s been the easiest and most reliable of any consumer grade golf device I’ve used to date. As with other small radar-based devices, you do need to specify the club being used for each shot. This is necessary because of the smaller doppler unit inside the Mevo. By way of simple explanation – think of radar as projecting a window through which it expects the ball will launch. Larger radar units (FlightScope X3) can project windows large enough to accommodate nearly any launch parameter and by extension, any club. With a smaller device, you get a smaller window, and so it becomes necessary to provide the device with an idea of how high you expect the ball to launch. This is accomplished by selecting the club you’re hitting from inside the Mevo app. Currently, Mevo offers three modes – Indoor, Outdoor, and Chipping. The latter will be renamed Pitching in future releases of the app and applies to shots under 50 yards. In all modes, FlightScope recommends you affix small metallic dots (stickers) to the ball, which enable Mevo to more accurately capture backspin. It goes without saying that there are practical reasons why using metal dots, particularly in an outdoor setting, isn’t ideal, which is why a good bit of our testing was dedicated to learning the degree to which they’re necessary. Other settings allow you to adjust for distance to the tee (minimum four feet), and altitude. You can also select which data you want to be displayed on the screen. If you’d like, Mevo can audibly report a specific metric after each shot, so if you’re working on improving in a single area, you don’t need to continuously look at the phone. If you choose to record your swing (video), Mevo will detect the beginning and end of the swing, making the experience almost entirely hands-free. Additionally, basic editing tools are available which allow you to mark key positions in your swing. The Mevo app supports FocusBand integration and automatically syncs your data with the myFlightScope.com cloud service so that you can review and compare later. CSV download functionality (which made my life easier) makes it easy to pull your data out of the cloud for use outside of the FlightScope universe. All of your data, as well as any recorded swings, also remain in the app, should you choose to do all of your analysis from your mobile device. With the background out of the way, and the setup and use covered, let’s get into the meat of the review, beginning with an overview of our Mevo testing process. Testing took place over several sessions. We used the initial sessions to familiarize ourselves with the device, make informal comparisons of the data, and address any issues before digging into a full review process. Using two different single-digit handicap golfers (one indoor, one outdoor), we gathered data for a Driver, 6-Iron, and Sand Wedge in both indoor and outdoor modes. Metal dots were used on all indoor shots. Our indoor environment allows for approximately 14 feet of carry before screen impact. When testing outdoors, we collected (2) 5-shot sequences for each club. 5 shots were hit with metal dots affixed to the balls; an additional 5 were hit without dots. During outdoor testing, we made note of shot type/shape as our preliminary testing suggested Mevo may not handle poor shots particularly well, presumably because launch is often outside of the expected window. To establish a baseline, we used a Foresight GC2 with HMT. Where the recorded data differs significantly between devices, we rely on our eyes, our experience, and evidence within the data itself to determine which values are accurate. 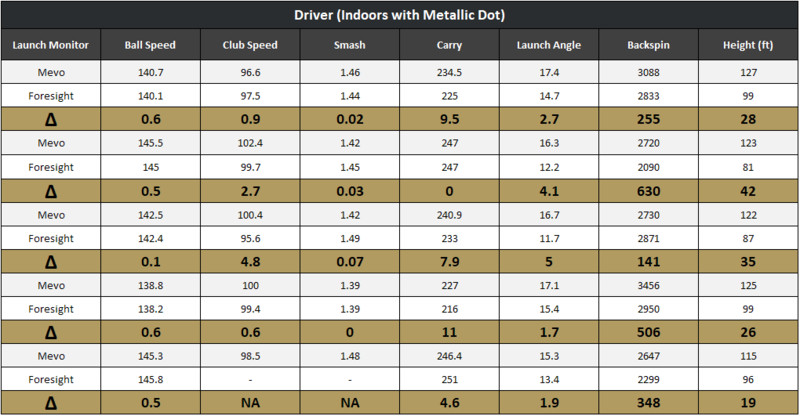 The driving range used for outdoor testing plays slightly downhill, which along with other environmental factors may partially explain the differences in reported carry distance. Be advised: we have several charts we’re going to show you. For each shot, we’ll provide both Mevo and GC2 data as well as the calculated differences between each metric. Note that Mevo includes a total flight time measurement, which Foresight does not. For simplicity, we have excluded that measurement from our charts. We observed consistently significant differences in the height value for the majority of shots recorded. Quite frankly, we don’t have any basis to argue which device is more apt to be right. I will note, however, that numbers reported by Mevo tend to be above PGA Tour averages, while the numbers from GC2 numbers tend to be below those averages. Foresight reports data in yards while Mevo reports in feet. To allow for a simple and direct comparison, we converted GC2 data from yards to feet. Before you dig into the data, please be advised of a couple of general consistencies within the data. Mevo most often provides a slightly higher value for swing speed, but on occasion will report significantly slower speeds. Mevo’s reported launch angle is usually higher – often significantly. 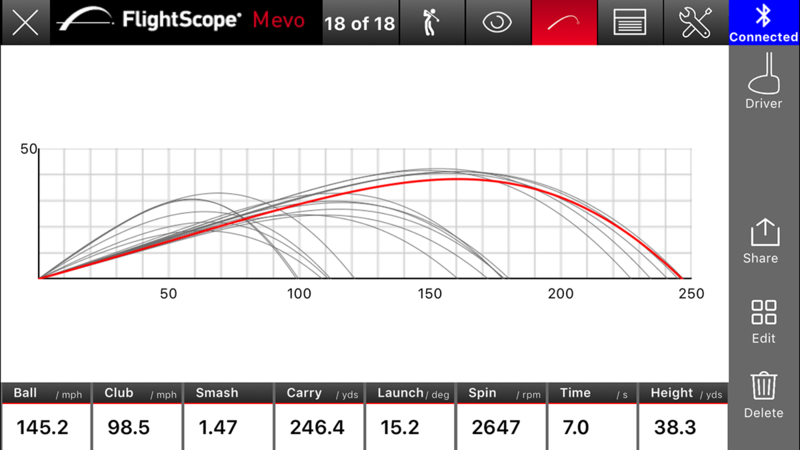 In fact, in our test set, for only 2 of 45 shots did Mevo report the same as or a lower launch angle than GC2. With that out of the way, let’s take a closer look. In general, Mevo impresses. 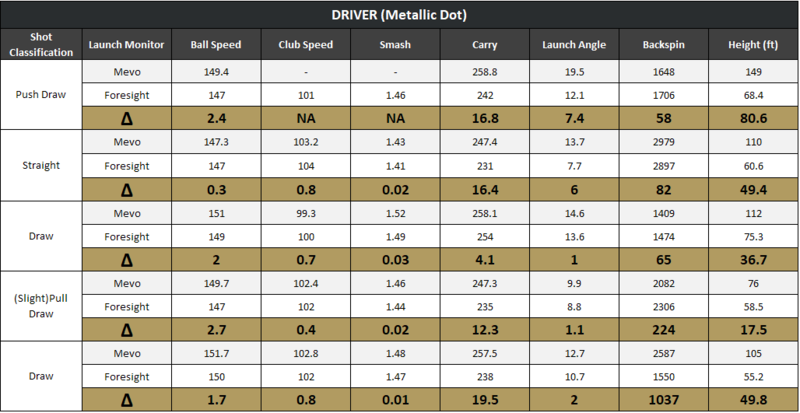 Ball Speed differences with the driver are slightly higher than ideal, but never by more than 1.8%. Differences in club speed are minimal. Mevo consistently reports greater carry. Some of the difference could be related to environmental conditions (GC2 doesn’t have a barometric sensor), but when it’s a question of which to believe, I tend to favor the unit for which the height measurement is most consistent with the other shots in the sequence. Differences in launch angle are greater than I’d like, and it’s my opinion that this is the metric where Mevo most needs improvement. Backspin measurements are excellent, and I believe, based on observation of the shot and the remaining data, that GC2 missed shots 4 & 5. 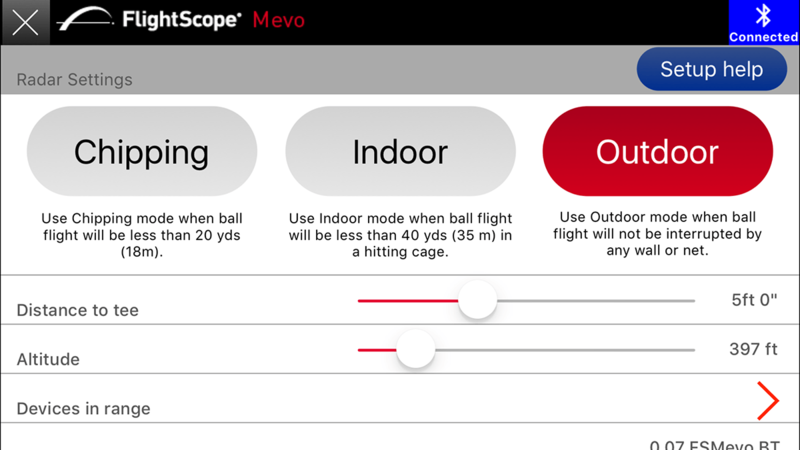 While Flightscope recommends always using a metal dot, we believe driving range with no dot scenarios are the most likely for a typical Mevo user. Performance is generally consistent with the previous set, with the exception of the spin measurement, which the data suggests is adversely affected by the lack of metallic dots. For the 2 shots with wildly different carry distances, I’m reasonably certain, based on other numbers, that Mevo missed the 2nd. I’m absolutely certain that GC2 missed the 3rd. Where we see the most significant differences in spin, the lack of metallic dot paired with the remaining data point suggests that for other than shot 3, Mevo is most likely to be off. Again, we see slight though not massive differences in ball speed. The important thing is that the differences are consistent and close enough that most will feel comfortable with the data. 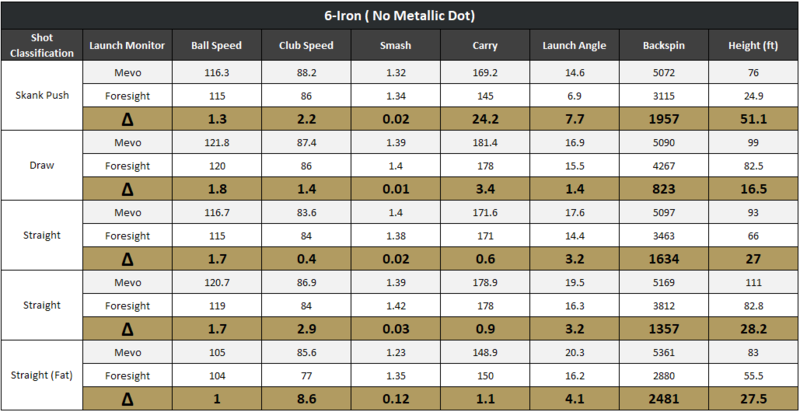 As noted above, Mevo reports 6-iron club speed significantly higher than GC2/HMT. Carry distances can vary significantly. This is likely partially explained by differences in ball flight algorithms as well as environmental variables. Nevertheless, anything above 180 is a stretch for this tester. With the metallic dot in place, differences in backspin are good to excellent on a comparative basis. For the shot with a significant discrepancy, based on the other numbers, I can’t say with certainty that Mevo is incorrect. Again, we see a significant jump in the deltas when the metallic dot is not used. As has proven typical, launch angles reported by Mevo are high. It missed Shot 1 entirely, though it’s worth mentioning that it was a complete mishit and not the sort of thing you’d expect to get meaningful data from anyway. The remaining carry distances are encouragingly similar. Both ball and club speed are in line with previous scenarios, with the exception of shot 5, where Mevo didn’t pick up the loss in head speed that resulted from premature ground contact. This is likely attributable to differences in where each unit (the point in the swing) takes its measurement. Ball speed is generally consistent with previous data. However, there are significant differences in club speed. Line for line, Mevo’s swing speed measurements are less consistent than previous examples, which could suggest an issue with tracking wedges. Carry differences are reasonable with the exception of Shot 5 where GC2 clearly missed the shot. Launch angle remains the concern as Mevo consistently reports higher, sometimes significantly so, launch. Spin numbers aren’t as tight as I’d like here (nearly 10% on the high end), and while we can toss the last shot, Mevo’s ability to handle higher lofted clubs may warrant closer examination as the deltas are consistently high enough to be of concern. As with the previous wedge data, we see a greater discrepancy in head speed with Mevo reporting less consistent data. 2 of 5 shots produced appreciable differences in carry yards. Again, spin differences are significant, though some users may be comfortable with +/- 500 RPM. For indoor testing, all shots were taken with metallic dots affixed to the ball. Our thinking is that in an indoor scenario, there’s no practical reason not to use the dots. 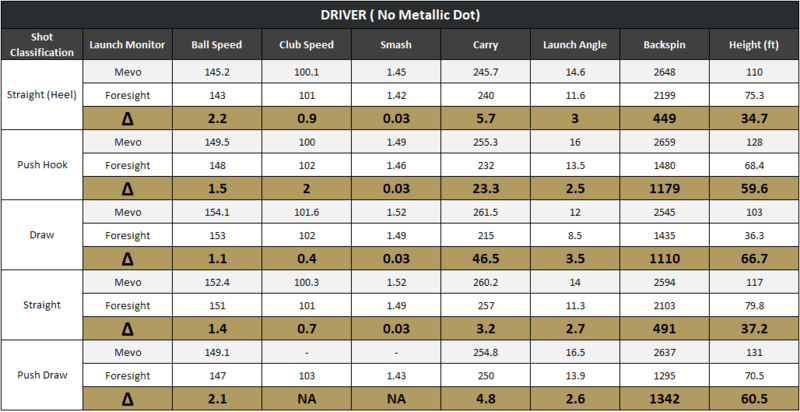 Ball speed and club data are generally consistent where we have full data. Mevo generally reports greater carry differences. Mevo’s reported launch angles are higher – sometimes significantly so. Backspin differences are greater than we’d like, with Mevo results being consistently higher. This suggests Mevo may struggle to track the driver in an indoor environment. Ball speed consistency is again impressive, while differences in clubhead speed are reasonable. Again, we find Mevo consistently higher on carry distance but consistently is the operative word here. The deltas for launch angle are again significant with Mevo reporting higher a majority of the time. Spin measurements are generally good. A delta of 381 is a bit higher than I’d like, but 50, 63, and even 101 are excellent. Two of Mevo’s clubhead speed readings – one high, one low – are difficult to explain, but on the remaining shots, the numbers are reasonably close to GC2/HMT. Carry differences are reasonable with the exception of a single shot where Mevo clearly missed the spin. While differences in Shot 1 may appear significant, it was an appreciable pull that may have launched outside the expected window. Mevo’s spin reading on Shot 4 is a bit of a mystery, but otherwise, it’s excellent on well-struck shots. In addition to full swings, we also tested the Mevo in chipping mode. The data we collected strongly suggests that Mevo struggles with short shots. I’m not posting the data because I believe we have more testing to do in this mode before drawing any conclusions. The issue could be as simple as our test shots (15-30 yard carry) being too short for Mevo to register. It’s also possible that selecting a lower lofted club setting to lower the expected launch window may provide better results. As I said, we have more testing to do. First, we reinforced what everyone should understand: every launch monitor – and I’ve used them all – misses shots. Perfection is an unrealistic expectation. 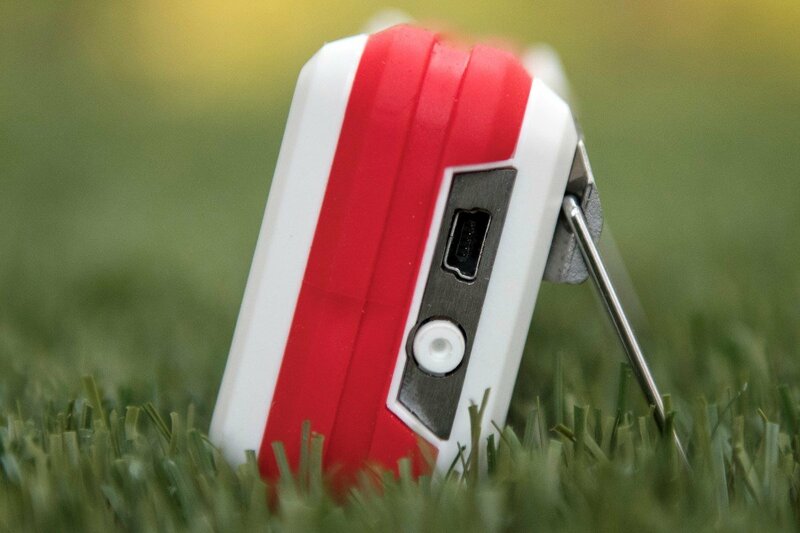 It’s also inherently unfair for us to test against Foresight, just as it would be unfair to put Mevo against Trackman or any of FlightScope’s other launch monitors. Mevo isn’t enterprise-class, and FlightScope has never suggested otherwise. As I said some 2000 words ago, in grading Mevo’s performance, it’s important that we set reasonable expectations. It’s unreasonable to think – though wouldn’t it be something – that Mevo would match the enterprise-class for accuracy and consistency. Our goal in using Foresight was to establish a baseline for consistency and accuracy. So, with that said, we’re impressed with Mevo’s ability to measure ball speed. Head speed measurements are generally acceptable, and when significant variances occur, it’s usually attributable to something like hitting the shot slightly fat or bouncing a driver leading into impact. We’re talking about the kind of things that would cause us to toss the shot anyway. We must also acknowledge that different systems measure clubhead speed differently, so even when the swing is closer to perfect, different systems will often report different values. While carry distances were sometimes significant, I’m not overly concerned about it. Environmental variables likely played a role in the differences. Certainly, Mevo isn’t perfect, but I would expect that a user would learn his Mevo averages and use them as a baseline to determine the effectiveness of whatever he’s working on. Those same averages will also help you identify shots where Mevo doesn’t quite get it right. The high launch angles reported by Mevo are a bit of a concern. There’s room for significant improvement here, and I expect FlightScope’s development team is already working on it. While it’s not ideal by the absolute numbers, as with carry distance, Mevo is consistent enough in its measurement that I believe working off an established Mevo average may suffice. I certainly wouldn’t rely on it as a clubfitting tool, but if you’re, for example, working on hitting the ball higher, Mevo should allow you to evaluate the degree to which you’ve been successful. Flightscope’s instructions state that the stickers should be used in all cases – even outdoors in a full-flight (you’re not getting the ball back) scenario. While the quality of the spin data reported when the metallic dot is used exceeded my expectations, I’m not sure asking a user to sticker every range ball he hits is a reasonable request. 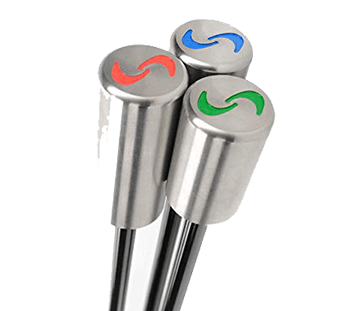 The good news is that at $25 for 1000, FlightScope’s stickers are reasonably priced, so should you choose to mark every ball, it’s not entirely cost prohibitive. Conversely, when dots aren’t used, spin measurements are all over the map – sometimes higher and sometimes lower than our baseline, rendering them useless as a basis for comparison. The data leaves little doubt that to get the most accurate numbers possible you absolutely need to use the metallic dots. It should also be noted that the spin problem isn’t unique to Mevo, we’ve seen this with doppler-based units in an indoor setting, along with the other small outdoor radar devices we’ve looked at in full flight scenarios. Without the use of metallic dots, none of these devices capture spin with any degree of confidence. Imperfect as they may be, the metallic dots offer a solution. Is Mevo worth 500 bucks? I’m guessing that’s what you came here to answer. At the risk of being less than helpful, it depends. In my estimation, there isn’t a better launch monitor on the market at the $500 price point, and no other device in its class offers the same level of Upside Potential. FlightScope has an opportunity to stake an early claim to the leadership position in the consumer launch monitor space. It would be foolish not to devote the resources necessary to take advantage, and I expect it will. If you’re looking to use it for fitting or your primary launch monitor in a teaching environment, I think the answer is no. If your use case demands absolute launch angle measurements, again, the answer is no. If you require precise spin measurements and aren’t willing to sticker every ball you hit, the answer is also no. If, however, you’re looking for an affordable device that provides generally consistent (though perhaps not exact) measurements for several key metrics, then Mevo is absolutely worth considering. The device is far from perfect, but I keep coming back to the fact that this is brand new technology for FlightScope and while functional as is, I suspect we’ll see significant improvements in both the accuracy of the data and the application’s feature set – and I don’t think it’s going to take particularly long for either to happen. Let me be clear – where we stand today (App version 1.1.1/Firmware version 1.8), Mevo has plenty of room for improvement, so there’s certainly a case to be made for taking a wait and see approach. But, if you feel like you need to buy now or you’re simply willing to cross your fingers and hope your investment will mature and live up to its potential, Mevo’s is the direction in which you should toss the dice, and I suspect it will be for the better part of the next few years. For more information on Mevo, visit FlightScope.com. Great review! I’ve come back a few times to go over the testing results. Still unsure whether I want to spend the $500. Forgive me for a potential stupid question but how does the consistency of carry and such compare to the swing caddie 2? 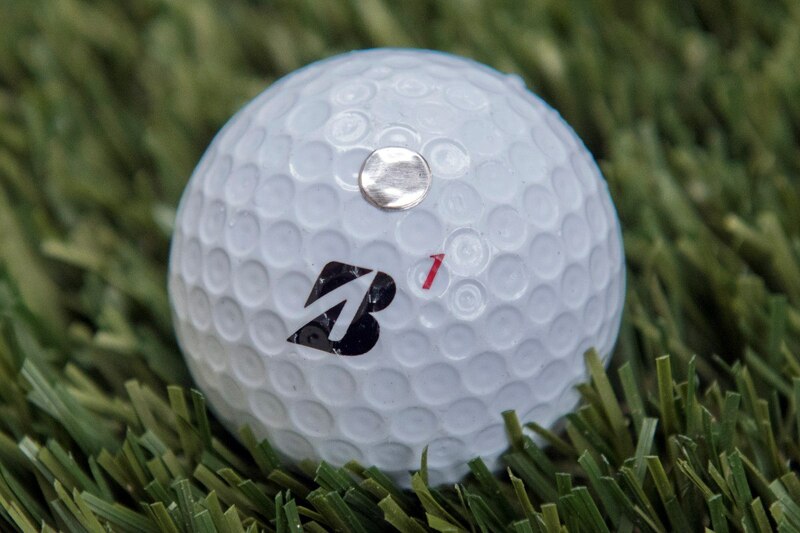 it would be cool if someone came out with a marker that has reflective ink or something so instead of sticking metallic stickers you can just draw a couple dots on your ball with the marker, that would make it super easy and cheap. You can use a soldering pen w/ a feeder. Thanks for the review. Any news from flightscope when a new model is going to come out? Would it be the same size you think? Also, any news from Foresight and Trackman if they are going compete in this space? Mevo is new to the market, so I would expect it will be at least 2 years before we see a new model. It really needs to be thought of in two pieces. First you have the device itself (the doppler radar). The path forward with that is likely a more capable unit in the same footprint, or a decision to go with a slightly larger radar to get better performance. Either way, there’s no urgency there as FlightScope most likely has the best hardware within this price category. The second piece is software (firmware and the App). This give FlightScope tremendous ability to tune the performance of the app, while adding additional features. I suspect this is where we’ll see the biggest advancements over the next 18-24 months. Thanks Tony. Didn’t want to buy one to only have a new better model, physical footprint, to come out a month later. I asked a sales representative prior to this, and they said they are working on it, but no scheduled release date in the future. Just wanted to see if what they said was true. This is going to be one expensive stocking stuffer. Thanks again for the review. Was looking forward to this one. 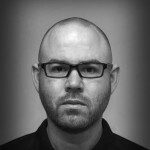 Tony – What concerns me the most with the data you posted is the difference in driver spin between the Mevo Indoor and Outdoor sessions, with stickers. Was this the same tester? Was his swing off on one of the days? Mental block hitting indoors (like me)?? I own a Mevo and have tested range balls with stickers and into a net outside with stickers, and I have never ever gotten spin outside of 2500-2800, which is about the same range it gives without stickers, so I am not sure how much I trust the data I am getting (or I am VERY consistent). Yes – as stated in the How We Test section, we used different testers for the indoor and outdoor portions, so we wouldn’t expect any relative consistency between the two sessions. Sorry, Missed that. My bad! Good to know it is capable of reading sub 2k spin. Is it possible to run a “non-metalic” dot test where instead of using the metallic dot, you draw a dot using a “metallic sharpie” where dot has a metallic sheen? Don’t know if it is actual metal fragments in the mark but if it works would be an easy way to add a dot to driving range practice. Others have tested and confirmed the metalic sharpies do not work. The dots are 2.5 cents though. The ranges practice at have plenty of range balls with dots now. lol! Do you have an image of how and where the Mevo was positioned behind the Player, Looking at your images we can see the GC2 but not the Mevo. I didn’t take pics of the setup, but I’m happy to give you the details. First, I’m not sure how you can make an assumption that mats moved based on a single still photo, but to assuage your concerns I can tell you that orientation was checked after each 5 shot sequence. As you may be aware, the GC2 has a relatively limited hitting area (roughly 6″x6″) and given that our portable Real Feel golf mats don’t provide an excessive amount of extra space for adjusting stance, had the mats moved by any significant margin, we would have had to move the GC2 (which we didn’t). I’d also add, as a matter of practicality, any launch monitor that can’t read shots based on small changes in ball position would be basically worthless. To provide the best surface possible for testing, instead of using the driving range (which tends to get beat up a bit), we did our testing on the level ground of one of the tee boxes at McGregor Links. To prevent damage to the teeing ground as well as to eliminate any potential issues related to divot obfuscation, we used the mats. We then used a block to bring the Mevo level with the hitting surface. Indoors – as noted in a previous comment – the Mevo was placed on level ground and the height of the hitting surface. As I mentioned in that previous comment, we did some experimentation with Mevo hight (placing both above and below the level of the hitting surface) but didn’t find any significant difference. In both cases, the Mevo was positioned approximately 4’6″ from the ball. I do wonder if moving the Mevo farther back would have resulted in different numbers, but I would have two concerns with that line of thinking. 1 – The stated minimum distance is 4′. If it doesn’t work properly at 4′, then the minimum distance isn’t actually the minimum usable distance. 2 – When you consider use case scenarios, one of the big ones is public driving range with some form of hitting stall/bay. If you have to position the Mevo much beyond 4′, it’s now in what is effectively a public traffic lane, which is less than ideal. Finally, I should mention that after our initial round of testing I shared some of the anomalous/less than ideal findings with Flightscope. We discussed setup, use of dots, etc.. They confirmed that what I was seeing is a known issue with some Mevo devices, so we held off on testing until we received the latest firmware update. That update most definitely improved performance, but the launch angle measurements, while improved, remain an issue. I really enjoyed this review. I completed an indoor driving range this spring, using the SkyTrak – which is about $1500 more expensive. However, after using mine for the past few months, and reading your review, I think I made the right purchase. Having data that tells/shows me how far off-line my strikes are absolutely essential for MY game. Sounds like there is some key data/uses for a specific use, but the accuracy of launch angle and wild variances on spin make less appealing for me. The metal dots are not really a concern for me, as I only use mine indoors. Can you comment on how the mevo was set up? I understand it’s pretty sensitive to level height with the ball and being on level ground. Could have influenced to high launch angles? Absolutely. As I mentioned in the review, we did some preliminary testing, and the launch angle thing is something we noticed early on. We placed Mevo near level (I say near because between indoor and outdoor, it may have been 1/4″ or so one way or the other) with the teeing ground. Early on I did some experimentation with the setup slightly lower, slightly higher, but didn’t see any appreciable change. In our first go-round of testing we saw even bigger discrepancies. For example, Foresight would say 10, Mevo would say 19. I’ve seen enough balls hit on launch monitors over the years that I can guarantee you I know which is correct. I think it’s something that will be resolved or at least significantly improved in a future firmware update, but I’m confident it wasn’t a setup issue. Has flightscope addressed or commented on the “issue” to you or that you’ve heard of? That would be great if is something that can be improved through updates. The latest firmware improvement definitely improved our results. I suspect we’ll see a few more in the coming months. I expect it’s going to get incrementally better as we go. Since Mevo provides spin rates, does it differentiate between side spin and back spin? Can it give you right or left spin so you know if you’ve hit a fade or draw? As always, you did a great job Tony. But there’s something strange in this test. – I hit 6 shots with my 7 iron straight in the center fairway of a par 5, very wide, long, flat and without wind. I used new balls and all the same (titleist pro v1). – My friend waited for the ball to arrive in the landing zone, and as soon as the ball touched the ground he placed the flagstick. I measured the distance with the Bushnell laser and compared it to that measured by Mevo. Well, the difference was never more than 2-4 yards. Never. I did the same test with shorter shots, about 50 yards, up to 90. Even in this case the accuracy was incredible: the difference was reduced to as much as 1-2 yards. At this point I can not understand why the test show so much difference in the carry between Mevo and Gc2. Don’t what to tell you beyond the realities of how Mevo works. 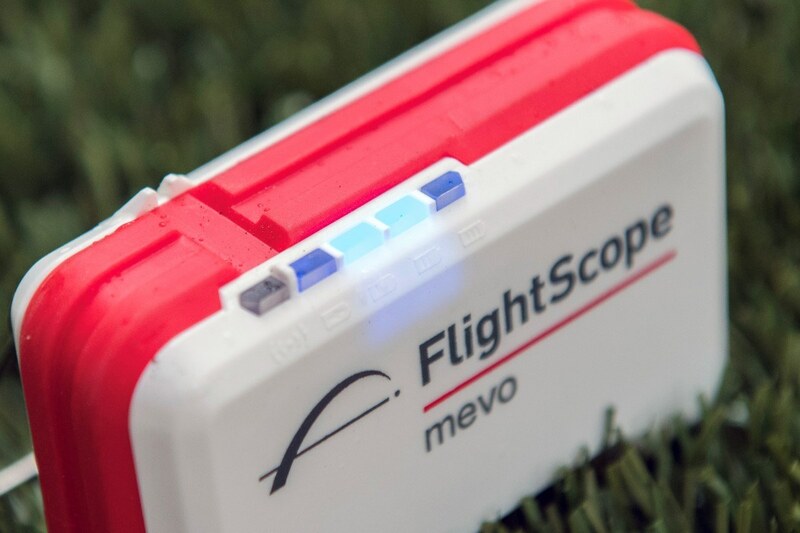 Unlike Flightscope’s other unit’s Mevo doesn’t track the full flight of the golf ball. While the actual tracking distance isn’t stated, I suspect it’s similar to what the indoor units label as limited or partial flight (forget the exact terminology). Since Mevo does not track the entire flight, it must extrapolate/calculate based on what it does see, and so projecting accurate carry distances is dependent on acquiring other variables correctly. Those key metrics would be ball spin, launch angle, and spin rate. We have clear evidence that suggests Mevo reports launch angle high. We know ball speed is excellent, and spin rate can be hit or miss. Bottom line, unless you’re tracking full flight, if you don’t acquire the other variables within a small tolerance, your distance numbers will be off as a result. The review is about what I expected but I am still left with major questions on which way to go. I expect in the next 5 years we will be able to buy a device in this price point with the accuracy and measurements we are all looking for. What I am curious about is the data you get from 3 different products and how to use that data for your game improvement. I have been inching towards Arccos, these are all in the same relative price point with Mevo being the most expensive. As a 10 handicap myself, I am trying to figure out my statistics for hitting GIR depending on driving distance. Am I better with a 7 iron from 170 or a PW from 135. That would change what I hit off the tee. Arccos would seem to be the product there. 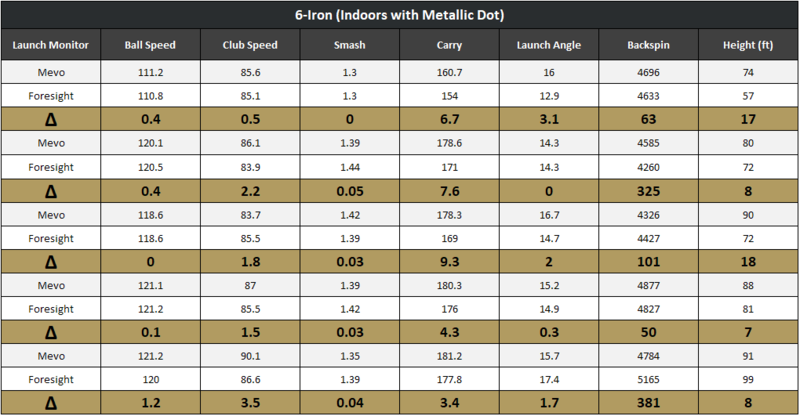 Knowing your carry distances is so important though as most of us don’t use enough club. IT IS ALL SO CONFUSING!!!!! But thanks MGS for making it fun to read and thank goodness we have Ebay to sell the ones we don’t end up using. To me there is a slight difference to note here. For real world improvements, the Arccos seems like the most useful (if accurately and diligently tracked) for tracking REAL distances from REAL golf shots and REAL golf balls. We’d all love to think we hit our best range shots on the course but we don’t. But tracking your golf game is more important than tracking your range ball. It also offers suggestions on areas of your game that need improvement. However, this won’t help you with improving your game based on the types of shots you’re hitting. A launch monitor can provide useful info for improving the quality of your golf shots and desired improvements to how the golf ball got there, not just where it went. Congratulations on an extremely comprehensive review Tony, as you mentioned Flightscope have a balancing act to perform with regard to data per pound (dollar) so to speak. They certainly haven’t got that balance right with me, as an Xi user I am more than a bit annoyed that they haven’t upgraded the Xi to show launch angle and spin in line with the Mevo’s data set. Mevo is a pioneer. If their foray into this space is successful, one would assume that the performance capabilities of this unit and other competitors to follow would increase over time and hopefully the price point would drop. I am sure that $500 is a relatively good deal for the data provided for many, but the price point, for me anyway, is just too high. Also, being an early adopter has its downsides. For instance, I paid a boatload for my Sky Caddie when they first came out and a lot more for the annual dues. The GPS I use now is a lot cheaper much more functional and gives me the same data at a fraction of the cost. So this time around I think I will pass — for the moment anyway. I’ll standby for a better deal. I understand and generally agree with your concern about being an early adopter. However, launch monitors can potentially provide an opportunity for one to improve their game; whereas, GPS systems are only helping one make better decisions around club selection. At age 54, I know that life is short. So the question I’m asking myself here is how much can I improve my game between now and when the price of personal launch monitors drops significantly? Is that savings worth waiting for? Potentially, I’d say no. I’ll happily be satisfied with my skill level being 18-24 months further along and the joy that wil come with that. Good luck to you, sir. Here’s my issue with this product: if you’re going to use the dot (which you basically have to to get any sort of accurate measurment, then you’re likely going to be using this mainly indoors or at home, hitting into a net in you basement or backyard. If you cannot see the ball-flight (which you can’t if you hit into a net), then what value does this really provide to the average hacker who will buy it? If the ONLY thing you’re concerned with is how far you hit a shot or how much spin you had on it, then I guess it helps, but those aren’t really things that most armatures should be working on. I want to know my face angle, path, decent angle, and where it impacts on the face so I can correct a hook or slice, etc. This gives you none of that. So unless you want to have long drive competitions or are working on hitting the ball farther, this doesn’t add much value over existing, cheaper devices that do the same thing. Maybe SLIGHTLY more accurate, but not enough to matter. It has it’s place for the right person with the right expectations. The average hack, like you’ve mentioned, usually just wanted to hit the ball further. If he uses the dots he can pretty accurately improve his smash factor and spin rates. These two things can and will gain him WAY more distance than any $500 driver. Irons also, if the average guy worked on smash factor with irons he’d launch the ball higher, with more spin (depending on his irons) and subsequently reach and hold more greens. Tony’s article does a great job laying out who this is for and who it isn’t for. With the right expectations and adequate ceiling heights, this could be the best $500 any fair weather golfer could spend to improve his game this winter. Then bust out another 6-14K and buy a model that gives all the club data. Mevo is great for gapping wedges, adjusting driver settings, verifying launch conditions. Is it too expensive? Depends on your paycheck, I guess. Voice Caddie SC200 does essentially the same for $300. Love mine. It gives me club head speed, ball speed, distance, smash factor and includes a remote. Seems like a decent monitor for the dollars. I have had the SkyTrak since it first came out. Price has gone up some, but pre-owned units are still good. I do not like the fact they have pulled away the improvement plan thus really forcing you to pay 100/year for having some level of usage over the free driving range. Not something that I would say should stop you if your in the market for the device. Kind of blows when you have been with them since the start and was part of the initial “test” group. What does Mevo actually measure vs what values does it calculate via an algorithm? I would expect it to at least measure launch angle, if not spin so I am surprised launch angles are so different. How would rate it against the seingcaddie 2000? Thanks for the review T. It went the way I thought it might, not an out of the park hit, but certainly not a bunt and out on first either. Hopefully, Flightscope will keep working on the soft and firmware upgrades needed to improve the unit for us recreational golfers that can’t throw down thousands for something else. I put myself on the wait list for a Mevo before they even came out, so I have had it since they were first made. I would have liked a bit more high end monitor, but I’m a grad student, so that wasnt possible. I am about a 10 handicap, here are my thoughts. 1) Mevo is generally pretty accurate. At the range, it get the distances and heights correct (or within a percent or two) about 19/20 shots if have a good strike. If you hook the ball hard, dont expect Mevo to be accurate on that shot. On a hard slice, it is accurate about 1/2 the time. On moderately bad shots, like a normal draw or fade that ends up off the target line, it will still be accurate about 16 or 17 shots out of every 20. 2) The software updates are not as quick as I would have hoped. A few useful features have been added, but there is still a lot left to be wanted. For example, the only way to open a hitting session is by time and date. They recently added a feature where you can name the session (for example, I can name it “Driver”) but cannot re-use that session at a later date. It would be extremely helpful if I could name a session for each club, then keep using that session every time I want to hit that club. This would make it much more simple to track improvement over time. 3) There are some bugs. Most frustrating is that every time I try to change clubs in a session the app (android, I cant speak for IOS) crashes, and I have to re-open it, and start a new session with the other club. As long as you are a little patient, you can make it through this. 4) The data got me serious results. I have only been golfing for 18 months, and owned my Mevo for about 6 months; since it came out. The feedback I get from the data has helped me get from shooting 100 six months ago(again, never golfed before) to shooting 78-84 on average now. The feedback from the data was extremely useful to get me there. I bought a net, and hit balls into it with the Mevo in my backyard, and the feedback is just as useful! I still use it at the range now and then, but with the data, practicing in my backyard is now a game improver! 5) It has its shortcomings; as the article stated, limited club head data, no off-line measurements, and the annoying software bugs. But you only pay 500 bones for it, and as long as you can be a little patient with the software (and still hoping Mevo will work this out soon), you can still get serious game improvement without the advanced club data. 6) I ABSOLUTELY would recommend Mevo for anyone like me who cant quite squeeze out 2-5 grand for a higher end launch monitor. Very extensive and detailed review, with supporting data, as usual for MGS! Well done! it does seem to pack a lot of info for the $500 price point. Having recently picked up a SC200 it is currently meeting all my needs, granted it doesn’t have the spin and launch that Mevo do, but those seem to be the two areas that Mevo still needs to improve on. As noted in your review, I’ll fall into the camp of wait and see what updates come in the next 6 months or so and take a look again. I work with a junior golfer. 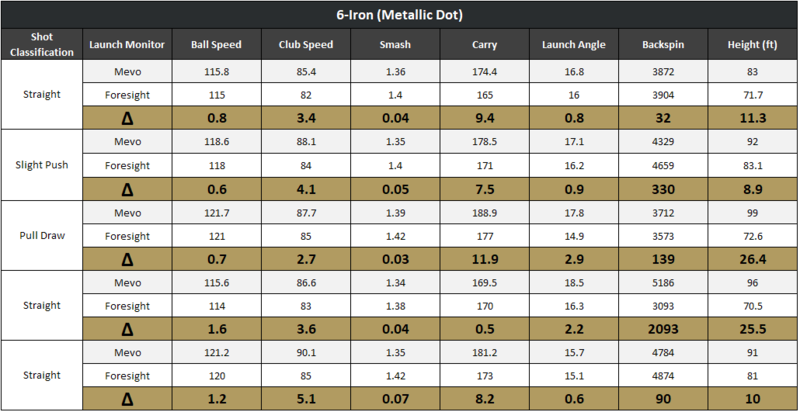 Working on accurate carry distances with each iron is very important to us. I’d love to test this on the course using metallic dots and compare it to actual carry yardages measured with a laser range finder. I don’t expect the Mevo to be spot on but if it can be proven to be consistent then it will be a great practice tool. Thank you MGS for a great review. I wonder if the sand wedge club speed numbers are off because the measurement window needs to angle upwards in order capture ball data on the resulting higher shot. That would mean that measurement down low near impact is compromised. An acceptable loss since I don’t think I have ever even considered what my wedge club head speed is. Does Mevo allow you to connect to software like TGC and play simulated golf which Skytrak offers? Mevo does not offer simulation capabilities. It’s a standalone device supported by an iOS app. I believe full sim capabilities start with Skytrak at around $2k. Just thinking out loud here, but wouldn’t Spin Rate be an input into distance, carry, peak height, etc calculations? If so, then not using the dots (while totally understandable) may be a possible factor in the “deltas” of Mevo’s output vs GC2….? Anyway, another great review – thanks! I do demo days for a major manufacturer and also like to “tinker” with my own club. For larger demo days, we use a new Trackman and I have use of the Foresight CG-2 for other demonstrations. Recently, I’ve been tinkering with my driver and experimenting with various shaft options using the Foresight CG-2onitor. The one downside I see to the Mevo launch monitor is the discrepancy in measuring driver launch angles. In a driver, that would be a “show stopper” as an accurate measurement of the launch angle is crucial in proper fittings. Perhaps, that metric should be improved before a wholesale product launch begins. Personally, I would not invest in a Mevo launch monitor until the accuracy is improved. Then, it’s worth considering. You guys really nailed this review. Thorough and all the data one could hope for. Great little device for what it is. Some will argue that but you did a great job outlining who it is good for and, who it is not good for. I first saw this device at CES in January and knew right away it was going to make some noise. I’ll admit that I’m a little disappointed with some of the data but, I’ll admit right now with no shame that my disappointment only stems from my own unrealistic expectation. I still want one! Excellent article. Unit well tested and vey honest assessments and comparisons made. One can’t realistically expect a $500 device to perform as accurate as a $20k device. That said, there are many that could improve their game by laying out approx the same amount as a new driver. I for one am going to put my toe in the water and give it a shot. What a great review. I agree that it’s not possible to compare the Mevo against a higher priced monitor, but I would love to see a different comparison done. Maybe you could do a side by side comparison between the Mevo and the SwingCaddy 2. I think this would be the comparison that the average joe would be interested in since it would be a more direct market comparison. You could maybe even work in the SkyTrak and the Ernest ES14 to the mix and see what is the best under $500? GREAT content though!!!! Thank you for doing this one! I owned a Mevo and loved it but it left me wanting more. I ended up selling it and buying a SkyTrak. I’m super happy with the upgrade and I think this is the sweet spot for home simulation. It’s spot on with GC2. What do those models cost? The cost between $3K-6K. Much more expensive but for me the added data and future plans make it worth it.